Last night marked the 82nd ceremony for the Academy Awards for motion picutres, otherwise known as "The Oscars." Depending on whether you had Time Warner or not (who was battling over its contract with ABC), you might have witnessed the traditional promenade of Hollywood gowns and tuxedos by all the latest and most expensive fashion designers known to man. Doogie Howser (Neil Patrick Harris) opened up the show with a full production song and dance routine to announce the two co-hosts, Alec Baldwin and Steve Martin. Martin had hosted it before but this was Baldwin's first time, nevertheless you wouldn't have known it; the two seemed very comfortable and naturally funny as they went down the row heckling the all the nominees seated in the front row D.L. Hughley style. Christoph Walz who did an outstanding job as the multi-lingual Nazi in Inglorious Bastards. Mo'nique!!!!!! 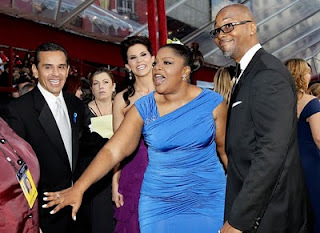 What can we say, the lady, as well as the movie Precious, has made a clean sweep from the Golden Globes to the Oscars! Sandra Bullock for The Blind Side. Can appreciate her work, don't appreciate the type of movie, as we've blogged about HERE. As Z predicted, Kathryn Bigelow for The Hurt Locker. Who, BTW, became the first EVER female Director to win an Oscar in the 82 year history of the Academy Awards. Not sure what that says about the Academy. As Z also predicted, The Hurt Locker. Avatar and Precious basically won everything else. However, we would be remiss if we did not talk about the lady who pulled a "Kanye" last night as the writer for Music by Prudence was trying to give his acceptance speech. What was up with that? SEE VIDEO HERE. And what was up with George Clooney's ice grill at the beginning? At any rate - The Oscars - so what did you think? What were the good and bad moments?